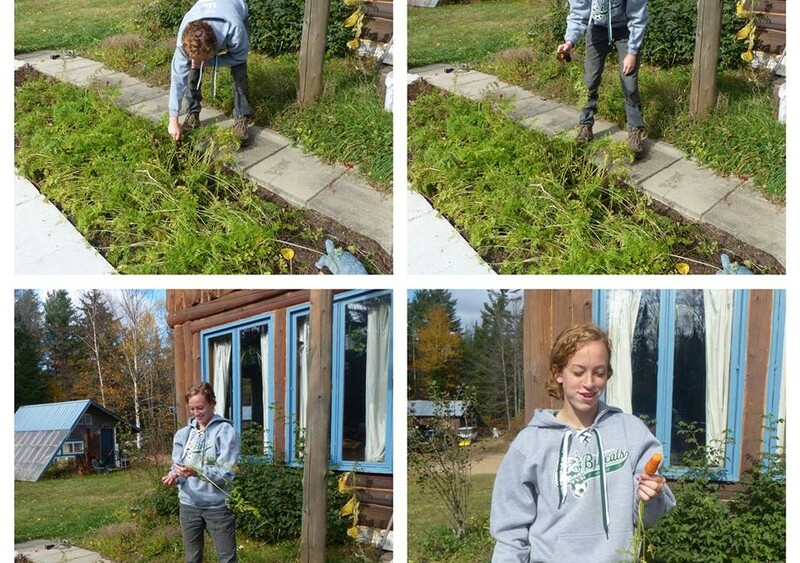 Last March, I started a forest gardening and herbalism internship at Timber Down Homestead. Timber Down is a homestead just down the road from PSC, which is owned by Paul Smiths College Alumni, Tracy and Nik Santagate. My internship opportunity came about as a result of the Santagate’s longstanding involvement with the Paul Smiths College community! I met Tracy through my Adventure Education teacher last fall, Tracey was a guest speaker in our class. My Internship duties were focused on learning by doing; specifically to propagate, cultivate, harvest, store, prepare and use wild and cultivated herbs, vegetables, shrubs and fruit and nut trees. In March of 2015, right around maple sugaring season, my internship started. My first task was to plant thousands of seeds in the Santagate’s greenhouse. I also started clearing an entire hillside of mostly strawberry and blueberry bushes and planting various shrubs like Winterberry, Red Osier, and Potentilla in their place. We did this in order to create a better growing sanctuary for the already established Silver Maple. Along with the work on the hillside, I helped collect sap, water the plants in the greenhouse, make lotions and salves, and start learning the properties of different herbs. In the summer months, I spent time at the homestead, I would observe the progress and growth of all of the plants that we had planted as seed in the spring, weed the gardens, and study plant identification. When this fall semester rolled around, my involvement at the homestead picked up where it had left off with harvesting seeds, drying herbs in the dehydrator, harvesting vegetables, teaching classes on the uses of herbs in different ways.I was also reading up on the properties of herbs to start the different garden beds, planting herbs specific to a certain body system in different gardens. Tracy and I currently have the digestive garden complete and are working on plans for the next garden bed. Starting this experience, I had never grown anything by seed or even owned my own plant. I didn’t know how to harvest sap or plant anything into the ground. I couldn’t tell you how to dig up a plant without killing it or how to even harvest a carrot from the ground! Although this experience hasn’t come to an end yet, I feel that I have already learned so many valuable things and have gained an appreciation for eco herbalism, and am passionately working to become a symbiotic, earth conscious steward of Timberdown homestead and the environment surrounding me. Sophomore: Recreation Adventure Travel and Ecotourism Major.